Nearly one-quarter of the Pentagon’s 2020 budget request would come through an account intended to fund unexpected overseas operations, a fiscal maneuver expected to be the most hotly debated item in upcoming congressional debate. Pentagon officials said the White House ordered the maneuver, which allows the $750 billion request to skirt a law capping the defense budget at $576 billion. Some $164.6 billion of the total would flow through the Overseas Contingency Operations account, which is exempt from the caps. $97.9 billion for items that the Pentagon would typically include in its base budget. $25.4 billion for war efforts in Afghanistan, Iraq, and Syria. There's also a $9.2 billion fund for “emergency requirements,” such as fixing bases damaged by hurricanes and sections of the wall President Trump wants to build on the U.S. border with Mexico. 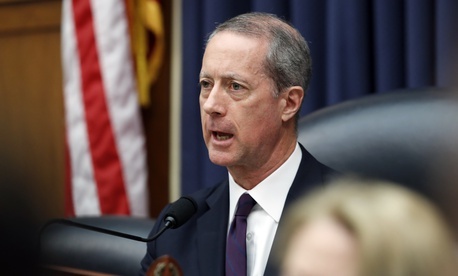 Rep. Mac Thornberry, Texas, the top Republican on the House Armed Services Committee, suggested on Tuesday afternoon that the hefty OCO account will be “dismissed” on the Hill. “I don’t think this was the Pentagon’s idea,” Thornberry told reporters. “It makes the administration, or at least OMB, less relevant in how that defense portion is constructed because everybody knows Congress would never agree to this giant OCO increase on its own. “I have to confess, the reasoning behind doing it that way is not clear to me,” he added. The use of OCO, and the dramatic increase in the defense budget overall, does have one powerful ally on the Hill: Senate Armed Services Chairman Jim Inhofe, R-Okla. A staunch ally of the president, Inhofe said in a brief interview that “I’m for doing whatever is necessary to get to the 750,” referring to the administration’s topline $750 billion budget request. Inhofe blamed opposition to the idea of using OCO largely on House Democrats — Thornberry and others notwithstanding. While briefing reporters on Tuesday, acting Defense Department Comptroller Elaine McCusker blamed OMB for the heavy reliance on OCO. McCusker also argued that the OCO budget receives just as much scrutiny and oversight from OMB and Congress as the Pentagon’s so-called base budget. She promised “a significant amount of transparency” to lawmakers. Perhaps the biggest sticking point of the $9.2 billion “emergency budget request” will be $3.6 billion to extend barriers on America’s southern border and another $3.6 billion to backfill any military construction projects put on hold to build such walls. Democrats, led by House Speaker Nancy Pelosi, D-Calif., have cast the Trump’s signature campaign promise as “immoral.” Even some Republicans who broadly support building more barriers along the U.S.-Mexico border are uncomfortable with the use of military funds to do so. The Senate is also poised to vote on an embarrassing resolution overturning Trump’s declaration of emergency to build the wall. Acting Defense Secretary Patrick Shanahan is scheduled to testify before the Senate Armed Services Committee on Thursday.